How have I never read this series? Where have I been, under a rock? Well, I have now emerged and find myself totally in love with Ram. Ram is an Alpha male who likes to always be in control. So when he finds his self caught between needing to find his soul mirror and his deep desire for Ginny, what is he to do? Add to that Ginny's sadistic father and his thunderbird trying to destroy him....Will Ram and Ginny find a way to overcome these obstacles? This is one of those books you just can't put down. 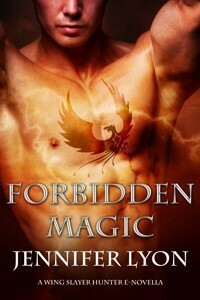 I rate this book up there with J.R. Ward's Black Dagger Brotherhood and Sherrilyn Kenyon's Dark Hunters! And if you know me, that is saying alot. Can't wait to read more from Jennifer Lyon!